Can war be seriously examined through art inspired by American comic strips? As a biographer I am fascinated by the different ways in which human stories from the past can be effectively examined and presented, particularly when this touches on my own current area of interest, the Second World War. So I was captivated when a friend and neighbour, Brian Sanders, published a stunningly beautiful and evocative picture book memoir, Evacuee. Sandy, as I know him, is now working on the sequel, about his life in post-war London, and invited me over to have a look. If you are as stunned as I was by the cover of Evacuee, I should perhaps mention that Sandy has had a wonderful fifty-year career as a professional artist with commissions ranging from magazine illustration, Penguin book covers and postage stamps to being the official artist portraying the making of Stanley Kubrick’s 2001: A Space Odyssey during 1964-65, and designing the advertising poster for last year’s acclaimed television series, Mad Men. However, it is Sandy’s work portraying war, and the impact of war on lives, that fascinates me most. 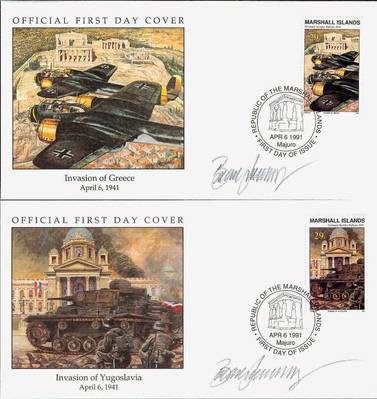 Sandy never sought a career as a war artist but commissions for various publications, and several series of stamps including those commemorating the 50th anniversary of the Second World War, naturally followed his experience and the trust placed in him as an artist who, as he put it, ‘had been there, and understood what war was’. Now a pacifist, Sandy has always aimed to report historically rather than comment through his art, letting events speak for themselves. ‘I wouldn’t glorify war’, he told me, but ‘in fact I have advertised war, I have done pieces for Officers Magazine and so on’. 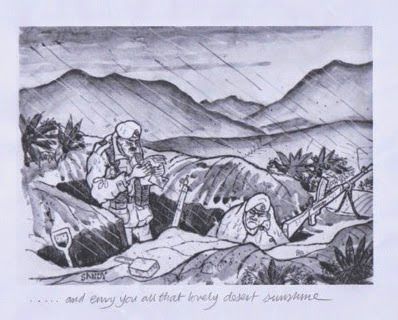 It was only when he came out of the Royal Marines that he gained a new perspective on Britain’s involvement in Suez, and his attitude started to shift. 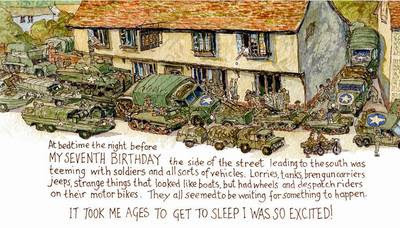 After a rich career in what is called ‘lifestyle illustration of the 1960s', Sandy is now taking a very different look at the Second World War, focusing on his own childhood as a London evacuee in Saffron Walden, a market town in Essex. Free from the constraints of commission or briefs, this is a very personal project, the impact of which comes from both its clear sincerity and its wonderful evocation of time and place. Sandy told me that his great blessing is that he has always known he had to draw. 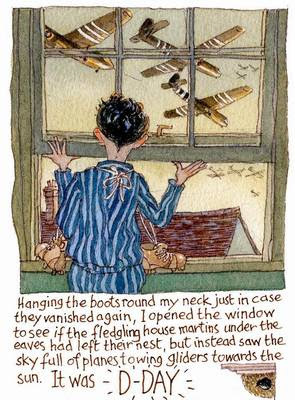 The Evacuee project began with loose sheets of pictures drawn from memories, and collected in a small black folder until he suddenly realized there was a book there. He found no problem remembering what he saw, and felt, as a child; ‘my problem is eliminating pictures, not finding them’, he told me. Soon he realized that the book was naturally going to be told from the perspective of his younger self in the form of the American comics that he had collected during the war, and long afterwards. In this way the book speaks directly to ‘children of all ages’, from three or four, up to 65 or 70; ‘the people who were there’. 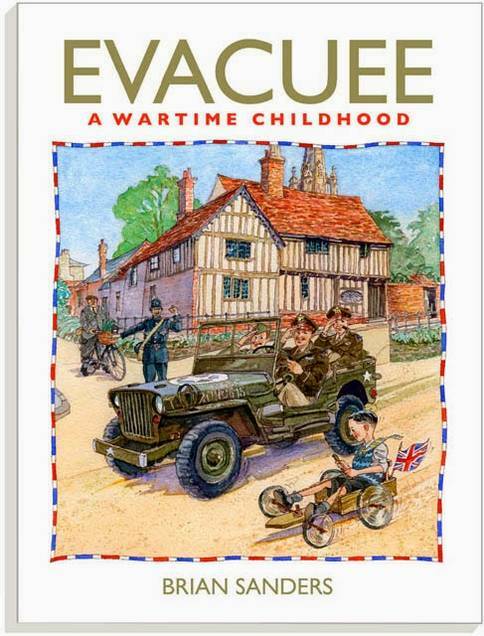 As a result Evacuee is great fun, with hundreds of wonderfully evocative visual details, and the echoing refrain that rang in his ears as a boy; ‘because there’s a war on’. And yet although Sandy’s own father survived the war, he makes a point of recording without unnecessary elaboration that those of two of his friends did not. Evacuee is an honest book and this, combined with the stunning art-work, is where its power lies. ‘It’s about the people that I love, that I loved at the time’ Sandy says simply. Although increasingly conscious from readers’ reactions that the book is seen as a much-loved contribution to social history, his intentions were always just to record and let the pictures speak for themselves. 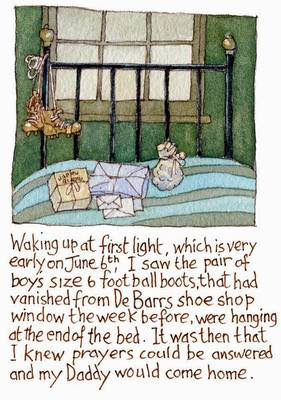 This is a world beautifully observed by a child and reproduced by his adult self, which is at once deeply personal and yet also gloriously familiar. ‘It is deliberately for everyone’ Sandy told me, but because it is his own story it is also compellingly authentic. Surely this is social history at its best.